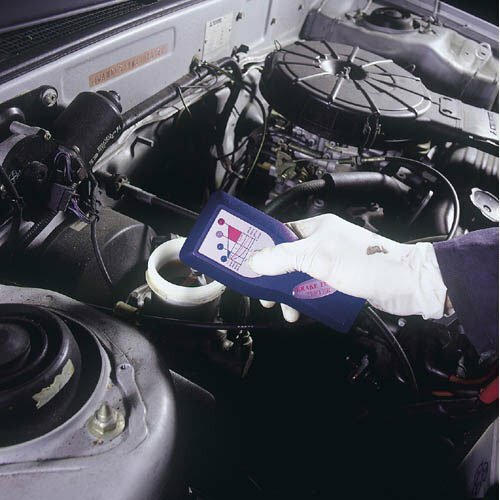 We offer brake fluid test for free. Why need brake fluid test? Brake fluid is hygroscopic. This means that it will readily absorb moisture. In fact, it will absorb moisture out of the air. Moisture in your brake fluid does two things. When the brake fluid becomes hot under hard braking, the water in the brake fluid boils. This causes steam voids in the brake system which causes a dramatic reduction in braking capability. In severe cases it can cause braking capability to be lost completely. Moisture in the brake system also causes internal corrosion of brake system components resulting in loss of braking capability. Therefore, it is extremely important to change your brake fluid at the specified intervals. Many motor vehicle companies recommend changing brake fluid every 12 months, others recommend changing every 24 months. The amount of moisture that brake fluid absorbs depends on a number of factors including the type of fluid, humidity, type of brake hoses, condition of the seals and mileage. Generally, brake fluid will absorb 1% or more moisture per year of service life. A two year old car will have 2-3% water in the brake fluid. 2% water reduces the boiling point of DOT3 brake fluid by approximately 135 degrees Fahrenheit (75 degrees Celsius). 2% water in DOT4 brake fluid reduces boiling point by 81 degrees Fahrenheit (45 degrees Celsius). It would be best to change the fluid at 2% water content. All vehicles should have the brake fluid changed when the water exceeds 3%.